William Hartnell: Doctor Who was launched in 1963 at the hands of television veterans Verity Lambert, Mervyn Pinfield, Sydney Newman and Donald Wilson. Ostensibly created as a children's program for the fall 1963 television schedule, Doctor Who was commissioned for 13 episodes and was never expected to continue for much longer. Thanks to terrific casting, clever writing, strong production values, state-of-the-art techniques for the time , and those tin-plated pepperpots that shouted "Exterminate!" -- that expectation was quickly overturned, and the programme soon became one of Britain's most cherished and beloved television legends. William Hartnell, a crotchety actor known for his versatility in a wide range of stage, television and film roles, was chosen as the Doctor, a role he would play for nearly three and a half years. Carole Ann Ford (Susan), William Russell (Ian) and Jacqueline Hill (Barbara) would join him as the weary travelers in the London Police Box whisked about on adventures through the cosmos. All three would eventually leave by the end of the second season, to be replaced by cast members Maureen O'Brien (Vicki), Peter Purves (Steven Taylor), Adrienne Hill (Katarina), Jean Marsh (Sara Kingdom), Jackie Lane (Dodo), Anneke Wills (Polly) and Michael Craze (Ben Jackson). Historical adventures were the staple of these early days; trips to Marco Polo's China, Palestine, the Aztec Empire, revolutionary France, ancient Greece and Rome, and even the Old West were among the travelers' many journeys. These were balanced by trips to far-off alien worlds, damaged spaceships and empires of exotic lands -- as well as trips to present and future Earth, wherein lay the Doctor's most devastating enemies: the vicious Daleks and the cold and calculating Cybermen. These first days laid the foundation for the mythos of Doctor Who; at this time, he was still an enigma, a mysterious traveler from an unknown time who was on the run from his own people. Not a clue to be found to bely his unique history and civilization. 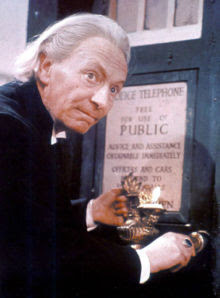 Hartnell left the role in 1966 at the height of the series' popularity, handing off the lead to Patrick Troughton. He continued to make appearances for several years, including a return to the series in 1973's "The Three Doctors" before his untimely death in 1976. Much of the era still exists, despite the BBC's purges of the mid-1970's; many episodes were found in unlikely locations domestically and overseas.